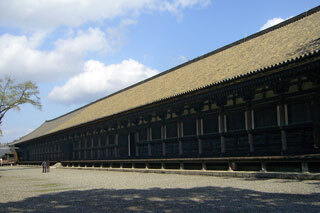 Sanjusangen-do is a Buddhist temple in Higashiyama District of Kyoto, Japan. Officially known as "Rengeo-in", or Hall of the Lotus King, Sanjusangen-do belongs to and is run by the Myoho-in temple, a part of the Tendai school of Buddhism. The temple name literally means Hall with thirty three spaces between columns, describing the architecture of the long main hall of the temple. This article uses material from the Wikipedia article "Sanjusangen-do", which is released under the Creative Commons Attribution-Share-Alike 3.0 License.